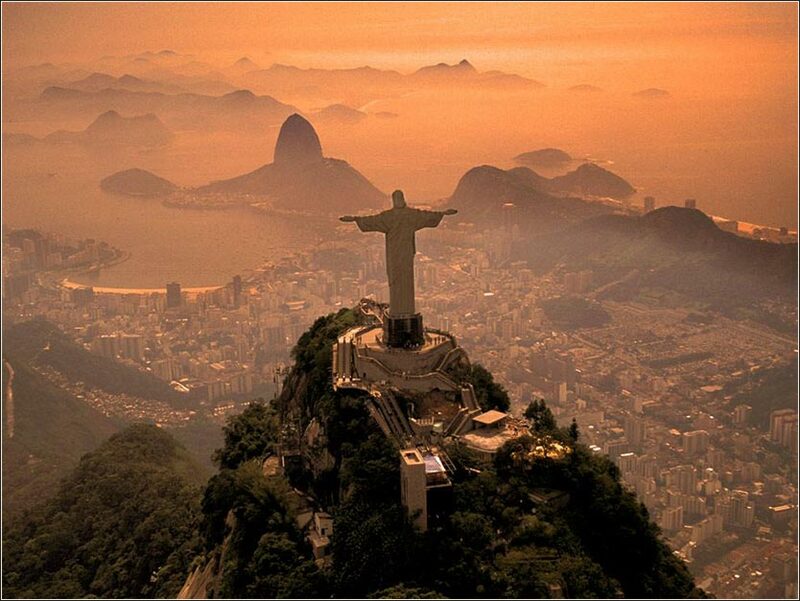 The famous statue of Christ the Redeemer overlooking Rio de Janeiro, Brazil. A fabulous old gospel slave song by Shirley Caesar: Satan, We're Gonna' Tear Your Kingdom Down. This is recorded at low volume so turn up your sound - you don’t want to miss this. Almighty God, the fountain of all wisdom, you know our necessities before we ask and our ignorance in asking: Have compassion on my weakness, and mercifully give me those things which for my unworthiness I dare not, and for my blindness I cannot ask; through the worthiness of your Son Jesus Christ our Lord, who lives and reigns with you and the Holy Spirit, one God, now and forever. Matthew 11, in which Jesus speaks about his (and John's) ministry, demonstrates six somewhat different modes or styles in which Jesus speaks. Today's passage is spoken in a voice meant to demonstrate confidence or certainty. We can call it the “Tone of Confidence”. We see it fairly often, when Christ feels that he needs his audience to understand the certainty of what he says. Developing faith among a core of disciples was a primary, and difficult, task Christ needed to accomplish in the short time he was alive and active in his ministry. The tone of discourse could not have a clearer example, because John's disciples ask him straight out if he is the Messiah. It is an odd question coming from John, who just a few months earlier baptized Jesus and declared him to be such. There are several possible reasons. Some have suggested that the question was for the benefit of John's disciples, not John himself. We need to divert for a moment, to understand what had happened to John by now; his story is told piecemeal over the four Gospels. As we will see in Matthew 14, John has been imprisoned by Herod (“Herod Antipas”, the Herod who ruled Galilee at this time). Herod had visited his brother (also named Herod) in Jerusalem, seduced his brother's wife, and then divorced his own wife to marry the woman. John, not one to mince words, denounced Herod vitriolically, and Herod arrested him and threw him in prison to shut him up. We must realize how painful life in a tiny, dark, windowless cell would be for John. He was the ultimate outdoorsman, a child of the open desert, living in the wilderness, eating locusts. It was like putting a wild bird in a shoebox. And he had little hope of ever seeing the sun again. So, he had to make plans for his disciples, and very possibly, he was trying to steer them gently towards Christ. Or also possibly, he was in personal crisis; for although his faith was enormous, he was human. So perhaps he needed reassurance from Jesus, whom he could not visit, that his ministry had been fruitful. Or, perhaps, his faith was simply maturing as he looked towards oblivion. Christ would often become demure, when asked if he were the Son of God, the Messiah; and his answer here is typically obliqueOblique: In rhetoric, a statement that proves a point indirectly; roundabout.. Instead of saying, “Yes, I am,” he recites the events that had surrounded his ministry. Matthew has taken pains to tie Jesus' miracles to ancient prophecies, and both John and John's disciples would know them and appreciate the significance of these acts. Such a response would certainly build more confidence than a person proclaiming, “I am the Messiah.” People lie, and everyone knows that people lie. So Christ presents the facts; but he does add, gently and indirectly, a hint that those who have faith in him are blessed. 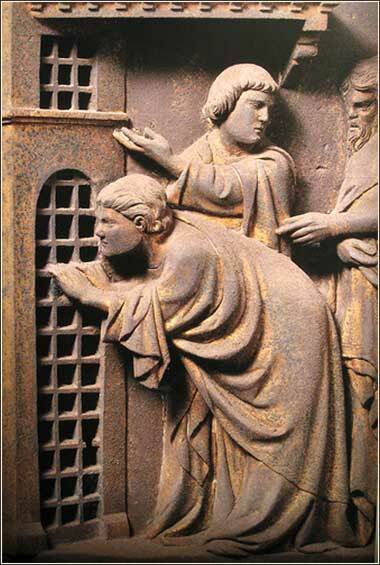 Disciples Visit John the Baptist in Prison by Andrea Pisano ca. 1463, for the south doors of the Florence Baptistry. Titus 3:9: Avoid foolish questions, and genealogies, and contentions, and strivings about the law; for they are unprofitable and vain.